As mentioned in my previous ESEE-4 review, I have lengthy experience with the knives of Randall Adventure & Training or more commonly known as RAT knives and during a replacement of my old TAK RAT knife I also ordered a neck knife sized IZULA Survival Knife Kit as well. The locals in Peru call the meanest, nastiest ant of the jungle by the name "Isula" also known as the Bullet Ant. The Bullet Ant is known to be independent, tough, light on its feet, and a real aggressive survivor - the IZULA knife is built the same way. ESEE designed the IZULA to be the perfect lightweight survival kit or concealed carry knife with a modest but stout and handy 2-5/8” blade with the knife weighing in at a feathery 2oz. 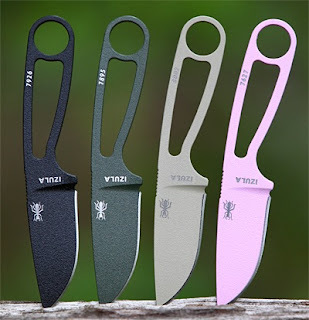 The knife is available in your choice of durable Black, Desert Tan, Olive and Pink powdercoat finish colors. I chose olive drab green finish although I was tempted by the hot pink because it would be short of impossible to loose. 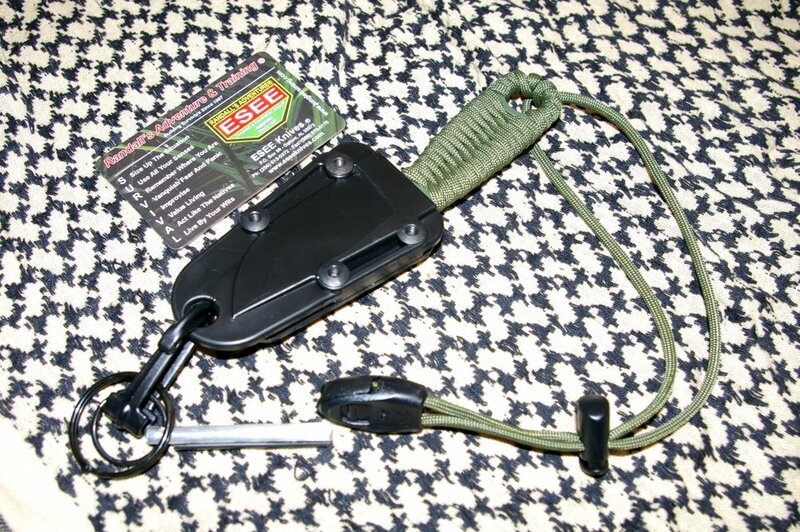 The ESEE IZULA knife is available as the knife and sheath only or with a complete survival kit such as the one I purchased. From a price perspective the knife kit is priced well at $107 MSRP and about $60-$75 street price... well within the financial reach of anyone. The IZULA Kit comes very secure and Kydex sheath which provides the basis for the flexible mounting systems. Included in the kit are several sheath mounting options including paracord for neck knife carry, belt loop carry, or lashing to a pack and a heavy duty ambidextrous spring clip backer for a variety of carry options ranging from MOLLE mounting, to inside the waistband carry, to boot knife carry, and clipping to a variety of equipment. The spring clip is attached to the knife securely via simple Chicago Screws and can be easily removed or reversed for ambidextrous carry in minutes to convert to another carry option. The kit also includes a plastic spring clip which can also be clipped either to the end of the handle or the tip of the sheath. The sheath also accommodates both the small and large sizes of Tek-Loks... one of my favorite carry accessories. I like the size and shape of the knife blade and handle however the skeleton’ized handle is clearly made to be paracord wrapped and doing so for me greatly improved the grip and comfort of the knife with very little increase in weight. The handle is a good size and not too big or small... obviously a well thought out handle design. I see no reason why you should ever be without this knife as it provides for nearly every conceivable carry option in a light easy to configure package. As noted in my other article, I have preached that a crappy sheath system on a great knife makes for a crappy knife package. The ESEE knives I have now own, IZULA and ESEE-4, demonstrate an attention to the fact that a great knife needs a great sheath or it will simply be left at home. The flexible sheath system in my mind is what makes the IZULA an outstanding knife and was designed by by people who are experienced in knife carry. The ESEE does not come in a big fancy four color printed box, it comes in a plastic bag which puts dollars back into the knife vs packaging. 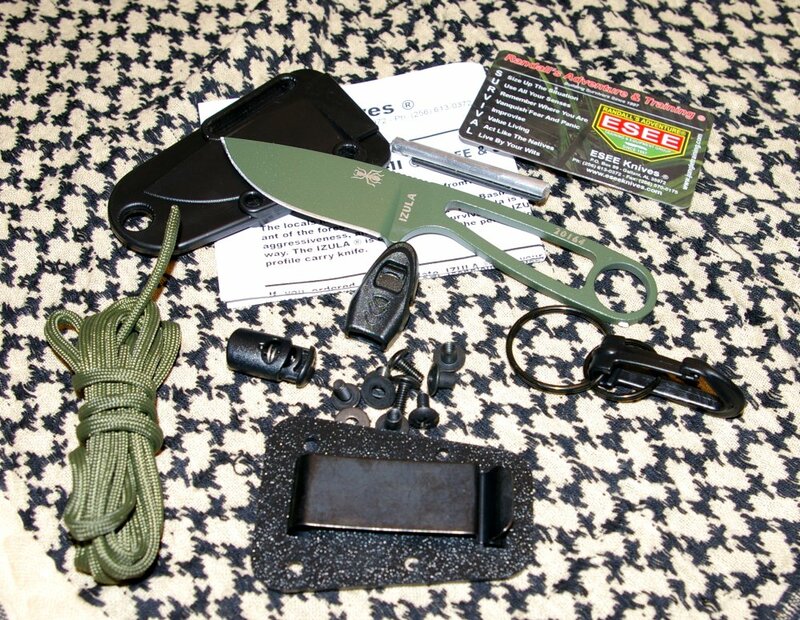 The ESEE IZULA Survival kit I purchased includes more than the standard knife and sheath with extras focused on those bare needs for survival. The kit includes all the carry accessories mentioned earlier plus a combination magnesium and ferro rod to provide very high heat with magnesium shavings and ignition via the ferro rod. 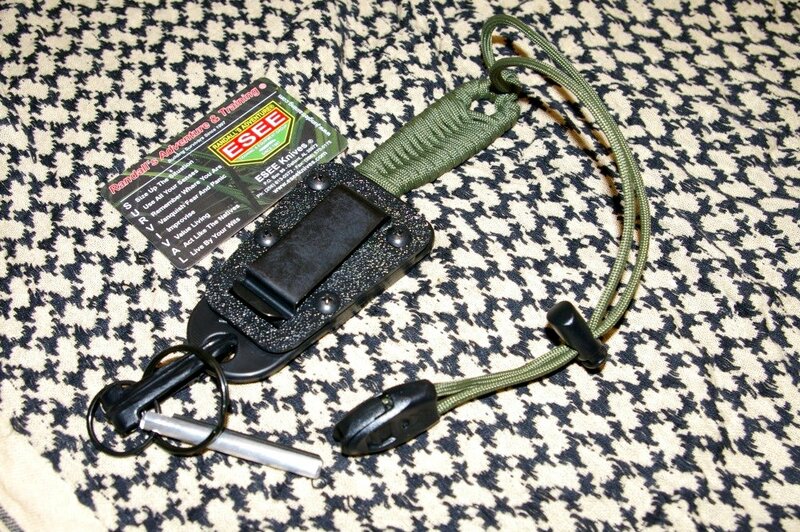 A large and small keyring are included for use in attachment and when combined with the paracord an excellent base for a snare trap. Other extras are complete instructions on how to use the sheath system, a RAT ESEE pocket survival card, a number of Chicago screws, a small paracord lock, and miniature high output survival whistle for signaling. A very nice survival setup for any trail runner, backpacker, outdoorsman, or survivalist. I have to note a firesteel is a handy piece of hardware and cannot count how many times it has saved the day lighting a campsite or even state park BBQ and picnic. Everyone should have a firesteel with them at all times. For survival and general bushcraft and game cleaning the drop point blade shape is one of the best designs. Like the bigger ESEE-4 I reviewed previously, the V-ground 1095 blade with a 20 degree edge is very easy to maintain with even just a steel and takes a razor sharp edge quickly. 1095 is not high end steel in the land of new crucible steels, however it does have a 57 Rockwell hardness and will take an edge much more easily off even river stones out in the field than the super hard crucible steel. The small 2-5/8”” blade is about perfect for general use, bushcraft, personal defense, and field food prep, however you will have your work cut out for you on larger branches “batoning” or pounding the spine with a small log. The 1095 steel is high carbon and will rust, so you do need to keep the knife lightly oiled. Another trick is to coat the exposed steel with Dijon mustard and let it sit for 24 hours. Wash it off well and touch up the edge with a steel. The Dijon mustard will oxidize the exposed steel and prevent any further rusting of all but the fine edge of the blade. - Blade Length (end of handle to tip): 2.88"
- Cutting Edge Length: 2 5/8"
- O.A. Blade Length: 2 3/4"
- 1095 Steel - 57 Rc. I support USA made products and this knife and accessories are all 100% made in the USA. The quality size and features packed into this IZULA survival knife kit are definitely well thought out by people who know, carry and most importantly, use knives. The IZULA is designed as a neck knife to be carried via the paracord dangled like a necklace, however I need to mention that I really liked The ESEE IZULA carried as a belt attached sheath knife with the spring clip. Another plus is that this is not a huge knife that would turn many off, or offend, and its price and size make me believe everyone should own one for moments of crisis. It is a very handy size that makes it easy to carry all the time and will not get left at home and is useful for everything from defense, daily cutting chores such as opening mail and packages, and has the perfect blade shape for field bushcraft and survival work. My recommendation is to buy one of these shaving sharp knifes. strong blade with that knife. Really i like it.